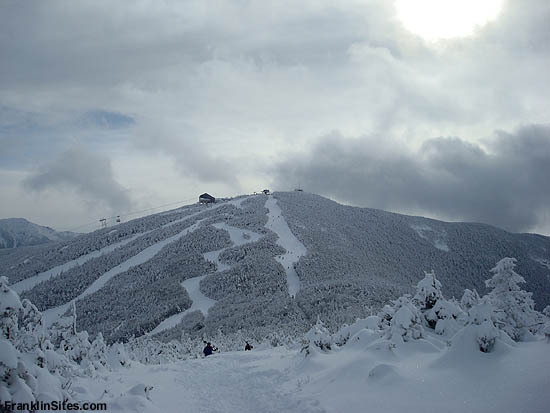 Cannon Mountain looms to the northwest over Franconia Notch with dramatic cliffs that one featured Old Man of the Mountain. 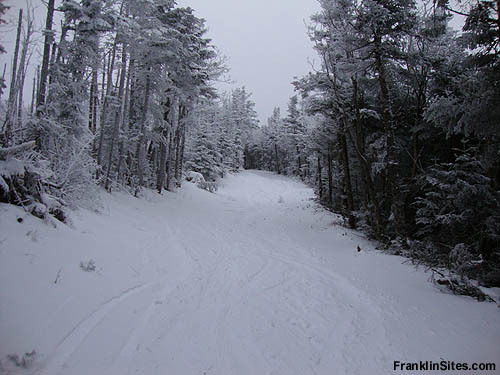 On the north and western sides, skiing has long been part of the history of the peak, starting with CCC ski trails in the 1930s and expanding to two separate ski areas for a few decades (Cannon and Mittersill). 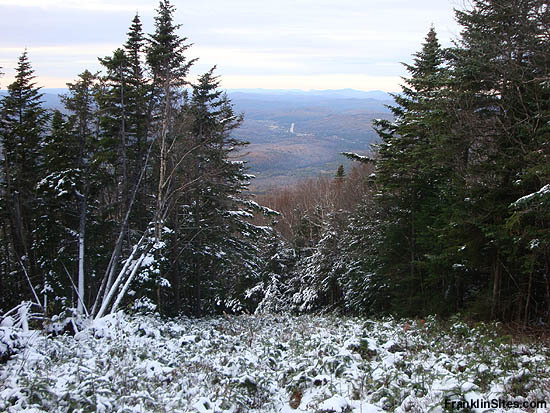 In 2009, all three components came together, as Cannon Mountain ski area absorbed Mittersill and portions of CCC ski trails. 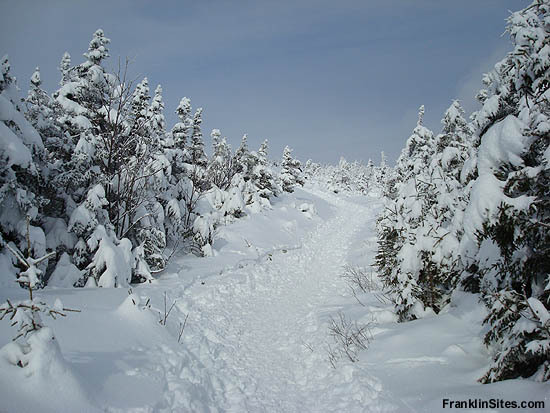 Named after the builder of the Profile House in Franconia Notch, the Richard Taft Trail was the first CCC ski trail cut on Cannon Mountain. Designed by Duke Dimitri von Leuchtenberg, fundraising was conducted by Katharine Peckett. 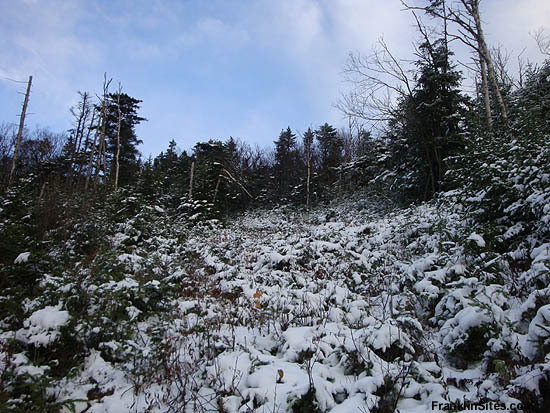 The trail was cut in the summer and fall of 1932 and first skied in February of 1933. While initiailly a very popular trail, the Taft Trail became less used when the aerial tramway was built in 1938, as the bottom was nowhere near the base station. 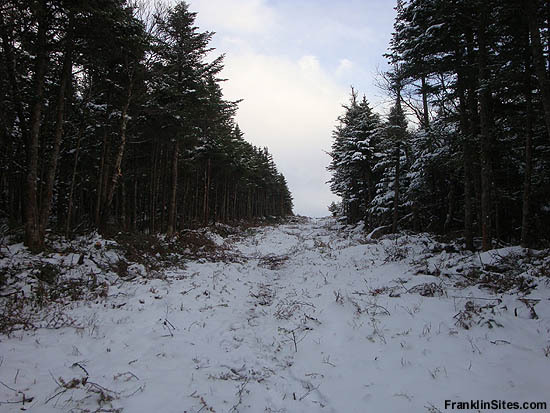 The lower portion of the trail was absorbed into the new Mittersill ski area in 1946. 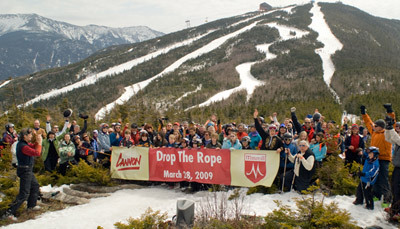 As of spring 2009, the entire ski trail is now under control of Cannon Mountain Ski Area. 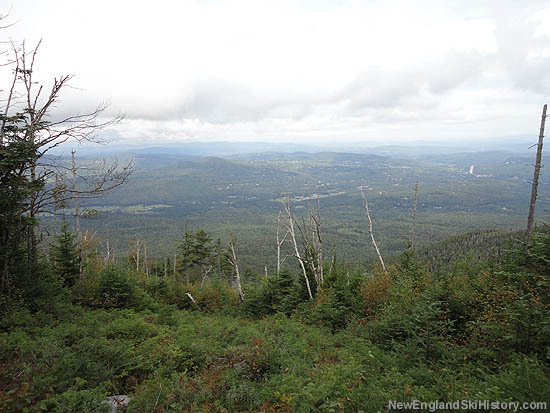 The upper portion has been part of the alpine ski area for some time, while the balance of the trail was added with the acquisition of the former Mittersill ski area. 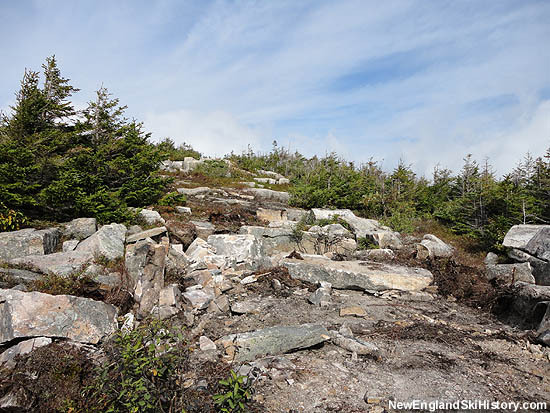 Some trail widening took place in 2009 and some blasting and regrading in 2010. Work on the Cannon Mountain Trail was started in 1937 and completed in 1938, despite major hurricane destruction. 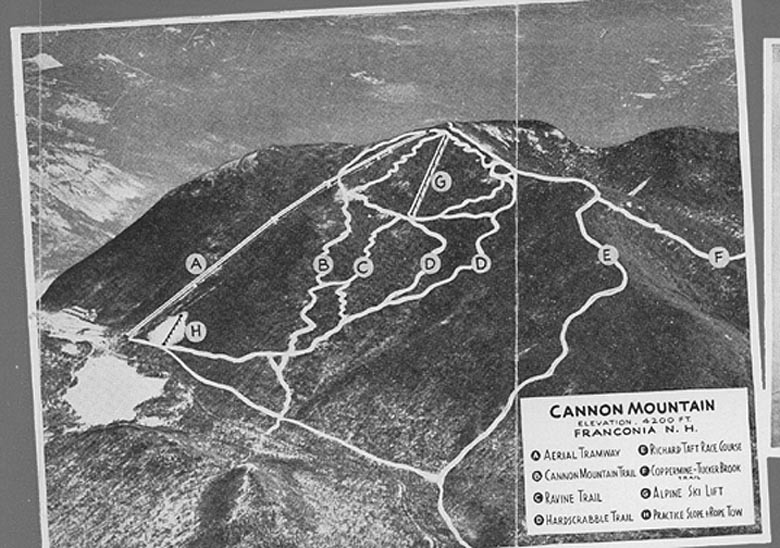 With the construction of the aerial tramway, new trails were needed to take advantage of the people-mover, as the previously cleared trails all ended well out of reach of the base station. 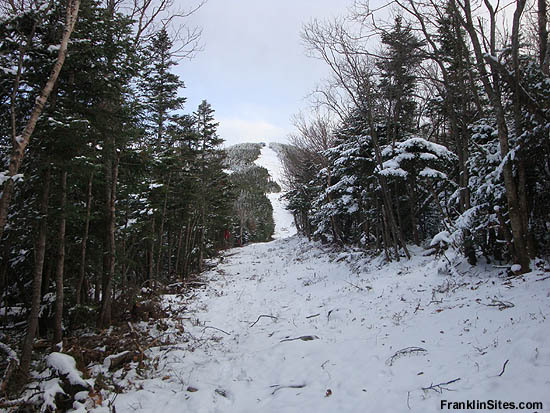 The Cannon Mountain Trail is still open today, in an altered state, as part of Cannon Mountain ski area. The Coppermine Trail has seen multiple iterations. The full version likely departed from Mittersill Peak to Bridal Veil Falls, then down to the valley. The upper portion of the trail quickly disappeared after the tramway was opened, however it is likely that it existed in an altered state in later years. 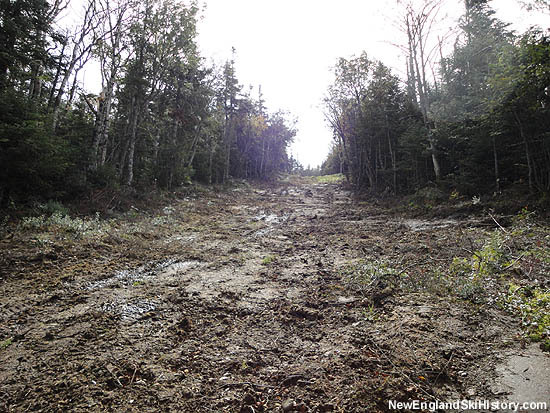 Portions of the trail are still around, but not popular for alpine skiers today. 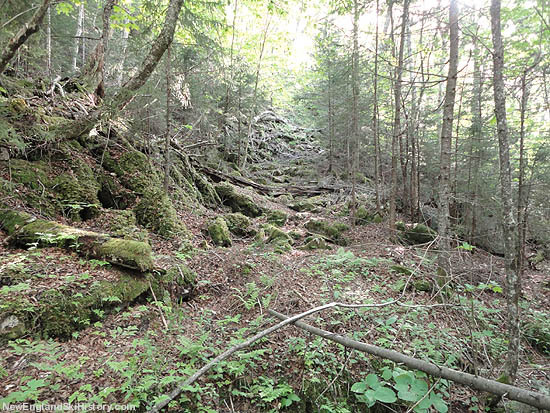 Also known as the Tucker Brook Ski Trail for awhile, the Meadow Brook Ski Trail followed the route of the current Tucker Brook Trail near the bottom, before connecting to the Coppermine Ski Trail below Bridal Veil Falls. 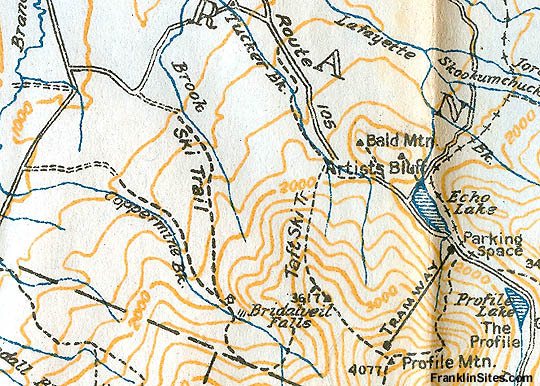 The trail was likely rerouted to the current route (staying northeast of the falls) after 1940. Work on the Ravine Trail was started in 1938. With the construction of the aerial tramway, new trails were needed to take advantage of the people-mover, as the previously cleared trails all ended well out of reach of the base station. 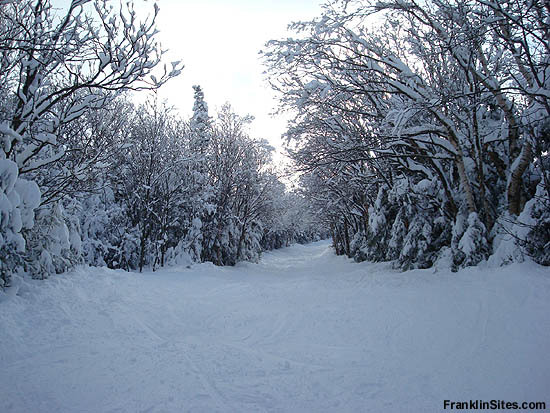 The Ravine Trail is still open today, in an altered state, as part of Cannon Mountain ski area. 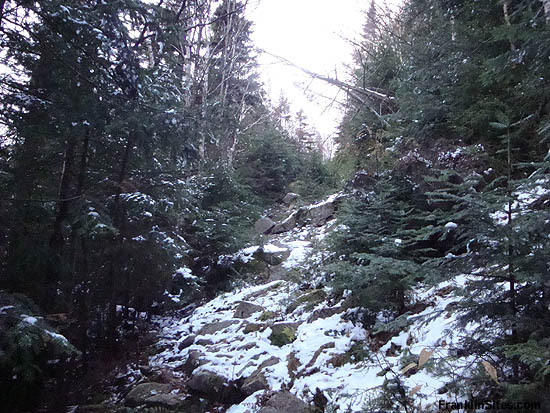 The Tucker Brook Trail descends from the Richard Taft Trail near the top of Mittersill Peak to Tucker Brook Road (off Wells Road). Though the trail saw a drop in popularity with the opening of the aerial tramway, it continues to be maintained today for backcountry alpine skiing. 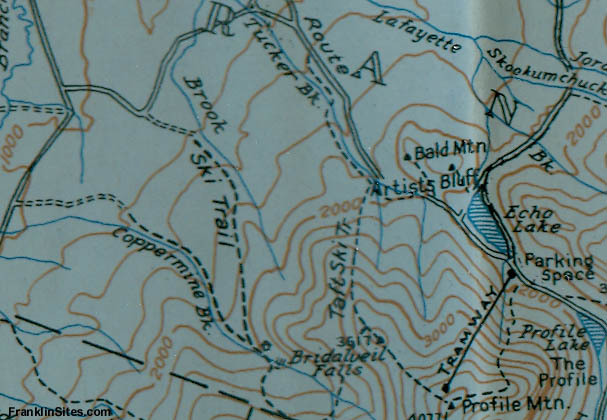 An early route of the trail, also known as the Meadow Brook Trail, curved over to Coppermine Brook, ascending to the summit of Mittersill Peak (Mt. Jackson) as part of the Coppermine Trail.
" 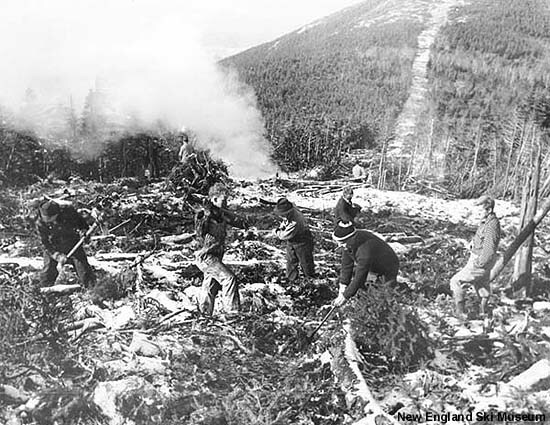 1932: Civilian Conservation Corps cuts first ski racing trail (Richard Taft Trail) on mountain, over NW summit. 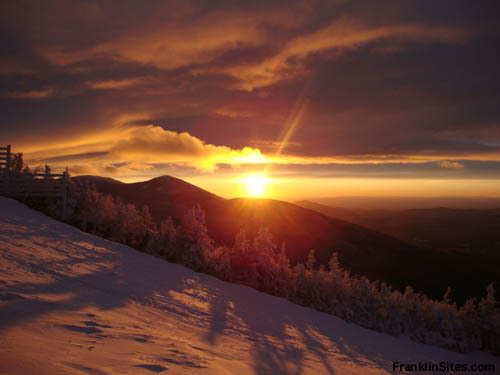 "A wide variety of turns lends excitement," notes a ski guidebook of the era. First descent is made in February 1933 by Austrian Sig Buchmayr, who is ski instructor at Peckett's inn at nearby Sugar Hill. 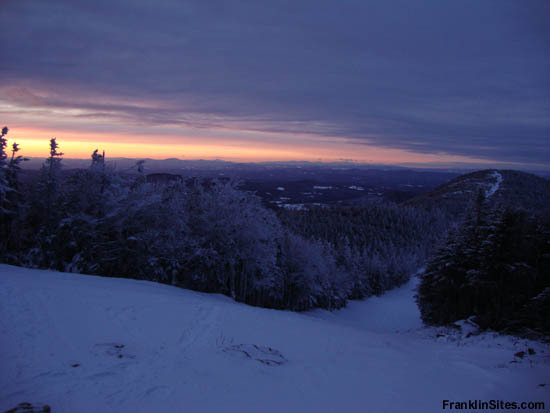 In subsequent years Coppermine Ski Trail is cut, leading from Taft Trail down to Bridal Veil Falls and NH 116, along with adjacent Tucker Brook Ski Trail descending from Coppermine Trail into next valley to N. "
" Richard Taft Ski Trail. This trail is a racing course for advanced skiers only. It starts from a point on the highway (N.H. 105) about 2/3 m. N.W. of its junction with the D.W. Highway (U.S. 3) at the N. end of Echo Lake. There is a sign on the S.W. side of the road. 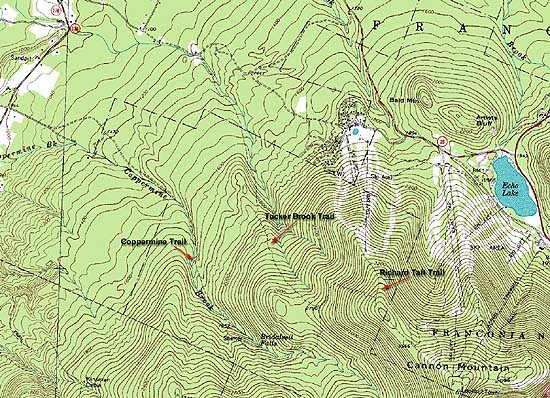 The trail ascends S. and E. for 2,200 ft. in 2.1 m. to the main (W.) summit of Cannon Mt. It is in general 15 to 25 ft. wide and on the curves 35 to 60 ft. wide. For good skiing 18 to 20 inches of snow is necessary. 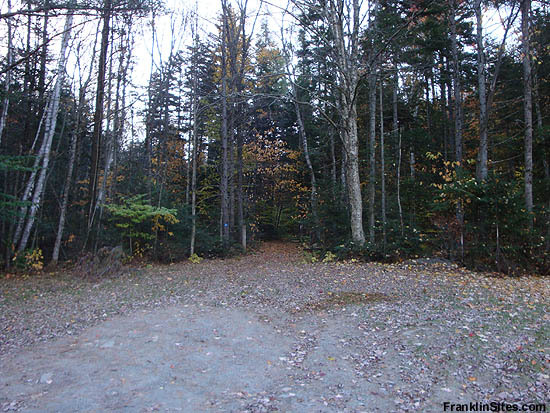 There is ample space for parking cars at Profile Clearing, 1 1/2 m. S. of the foot of the trail, also at the top of Three-Mile Hill on N. H. 105, 1/4 m. from the trail. There is a shelter at the foot of the trail and another half-way up. 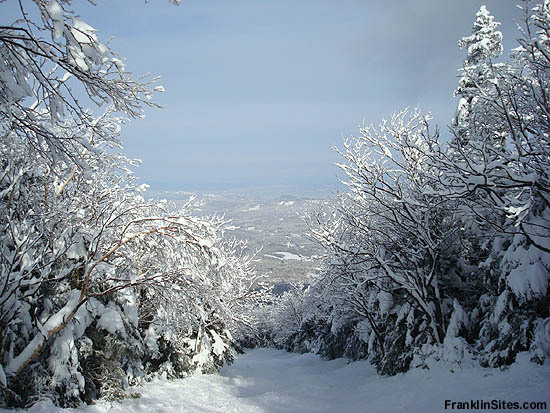 Although primarily a ski run, this trail offers many vantage points for the summer climber, as the views, especially of Mt. Lafayette and the Mt. Washington Range, are magnificant. " 1. Location - S. of Franconia on H. 166 (E.). Trail joins Richard Taft Trail at start of race course. 2. Length - 4 mi. to Richard Taft Trail; 2.5 mi. to Bridal Veil Falls and shelter. 5. Vertical Drop - 2000'. 6. Exposure - W. with short section to S. 8"-10" snow on lower half and 18" on upper. 7. Easy novice trail as far as Bridal Veil Falls. Upper section for intermediate and expert skiers. " 1. 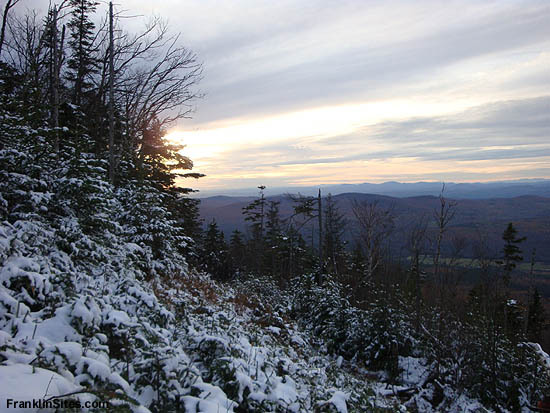 Location - W. from H. 105 at height of land in Franconia Notch leading to summit of Cannon Mt. 2. Length - Total - 2.1 mi. ; Race course - 1.4 mi. 4. Max. Grade - 34º. 5. Vertical Drop - From summit - 2200'; Race course - 1800'. 6. Exposure - N. About 18" snow. 7. 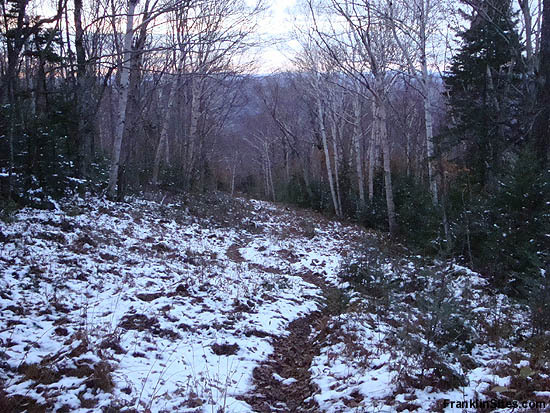 Expert trail with wide steep sections and a variety of turns. Shelter with stove at foot of trail. " 1. 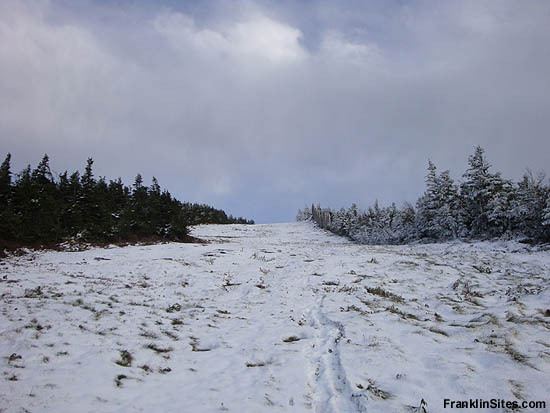 Location - Take Wells Road E. from H. 116 S. of Franconia and continue straight to trail which leads over ridge to Coppermine Trail near Falls. 5. Vertical Drop - 900'. 6. Exposure - N. W. 6"-8" snow.
" Coppermine Trail (W.M.N.F.). S. of Franconia on State 116 (E). Trail joins Richard Taft Trail at start of race course. Length 4 m. to Richard Taft Trail; 2.5 m. to Bridal Veil Falls and shelter. Max. grade 25º. Easy notice trail as far as Bridal Veil Falls. Upper section for intermediate and expert skiers. " " Richard Taft Trail. W. from State 18 at height of land in Franconia Notch leading to summit of Cannon Mt. Total length 2.1m. ; race course 1.4m. Max grade 34º. Expert trail with wide steep sections and variety of turns. Shelter with stove at foot of trail. " 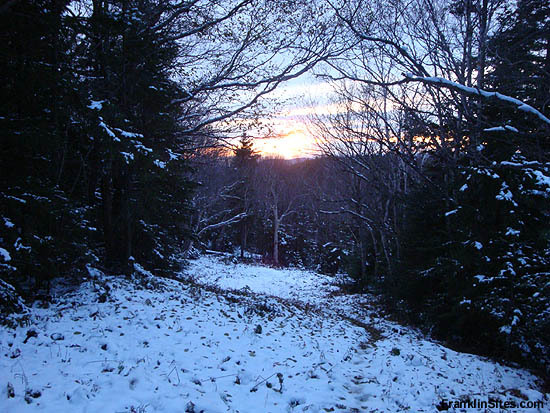 " Tucker Brook Trail. 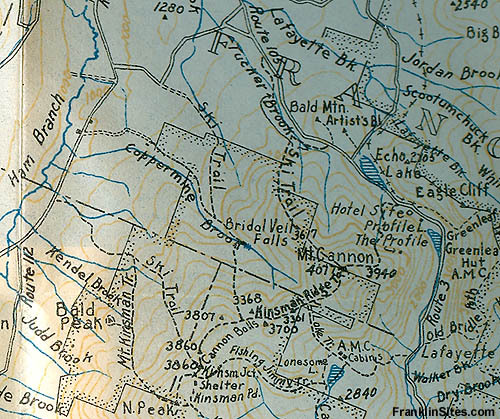 Take Well's Road E. from State 116 S. of Franconia, and continue straight to trail which leads over ridge to Coppermine Trail near Falls. Length 2 m. Max grade 15º. Novice trail. " 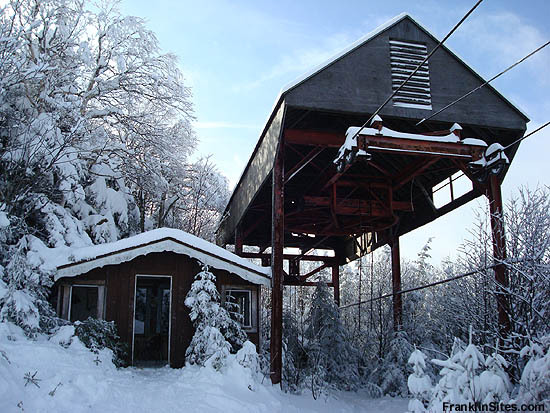 " Coppermine Ski Trail, begins 3.1 m. S of Franconia Village on NH 116, and terminates 0.8 m. from the upper terminus of Richard Taft Ski Trail, gaining 2,000 ft. elevation. The first 2.5 m. of this trail coincides with the trail to Bridal Veil Falls. Meadow (Tucker) Brook Ski Trail leaves sharp L at 1.3 m. At 1.5 m. a spur trail 0.2 leaves to the E to Bridal Veil Falls and an open front shelter and first aid cache; to Taft Trail 3.2 m.
Meadow (Tucker) Brook Ski Trail begins at the E end of Wells Road, which turns E off NH 116 about 2 3/4 m. S of Franconia Village. This road will probably be plowed for a distance of 1/2 m. from the main highway, and cars must be parked wherever there is sufficient width. The trail begins about 1 m. from the main highway. 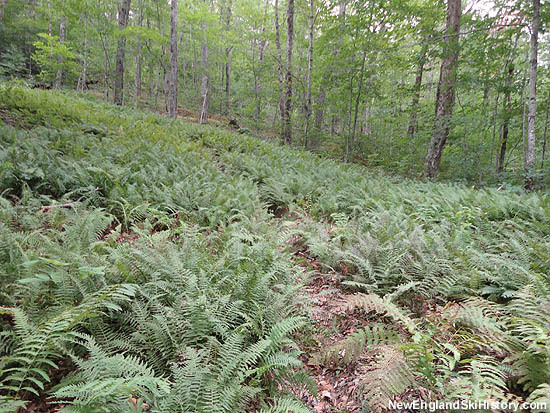 It extends S along the W bank of Meadow Brook, up a shoulder of Cannon Mt. to the Coppermine Ski Trail 1/8 m. below Bridal Veil Falls. The trail has only one short run, in the N direction, about midway of the distance, which is about 2 m. "
" Richard Taft Ski Trail. 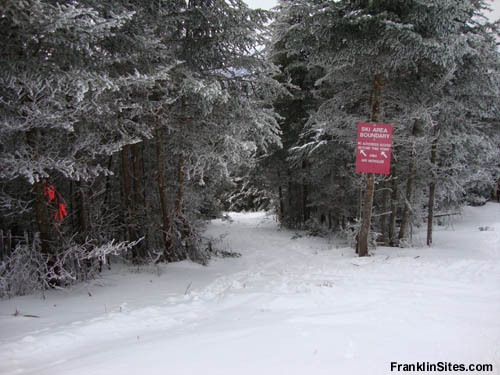 A racing course for expert skiers, this trail may be reached by a short side-trail from the top of the hill on NH 18 about 3/4 m. N of the junction of that road and US 3. There is space for parking cars at the top of the hill. 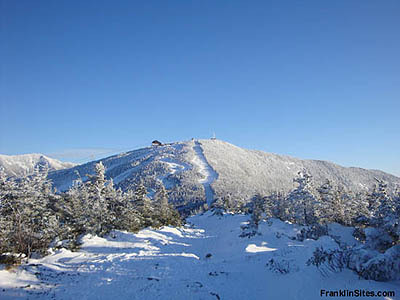 The trail ascends S and E for 2,200 ft. in 2.1 m. to the main (W) summit of Cannon Mt. There is a shelter about halfway up. 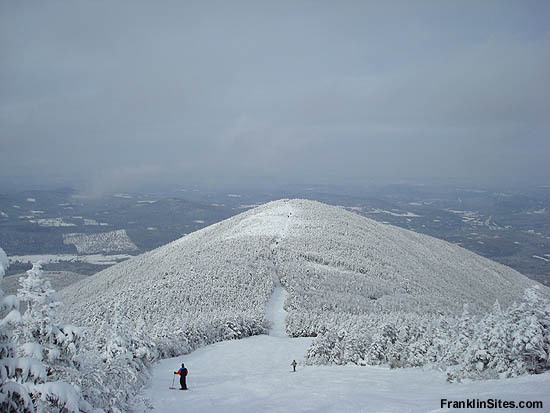 Although primarily a ski run, this trail offers the summer climber magnificent views, especially of Mt. Lafayette and the Mount Washington Range. " 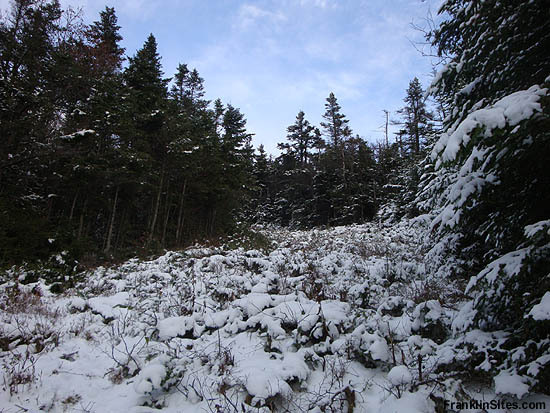 " Coppermine Trail (WMNF). 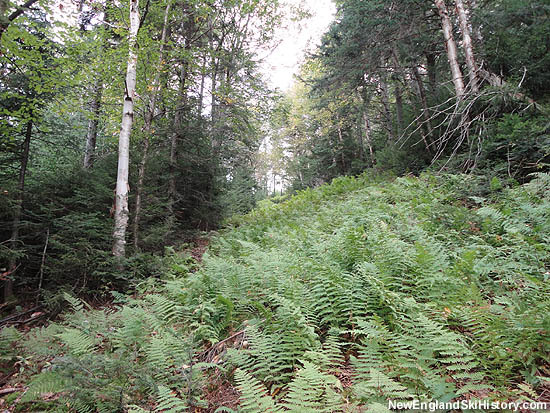 This trail leaves the E side of NH 116 3.4 m. S of Franconia and 7.7 m. N of Bungay Corner and follows along an old road which is passable for autos for about 0.8m. Continuing past the gate to Peckett's Camp the trail follows along the L (N) side of Coppermine Brook and finally crosses it. The trail ascends at a somewhat steeper grade, passes the WMNF open-front shelter and ends at the base of the Bridal Veil Falls. Distance. 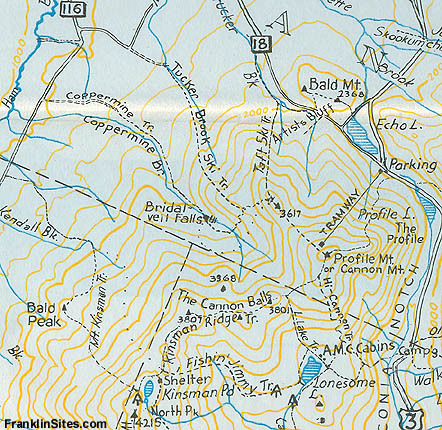 NH 116 to Falls 2.5 m. At a point 0.1 m. below the falls, the Coppermine Ski Trail leaves S, crosses Coppermine Brook, swings E, then N, recrosses the brook and ends at the Tucker Brook Ski Trail. 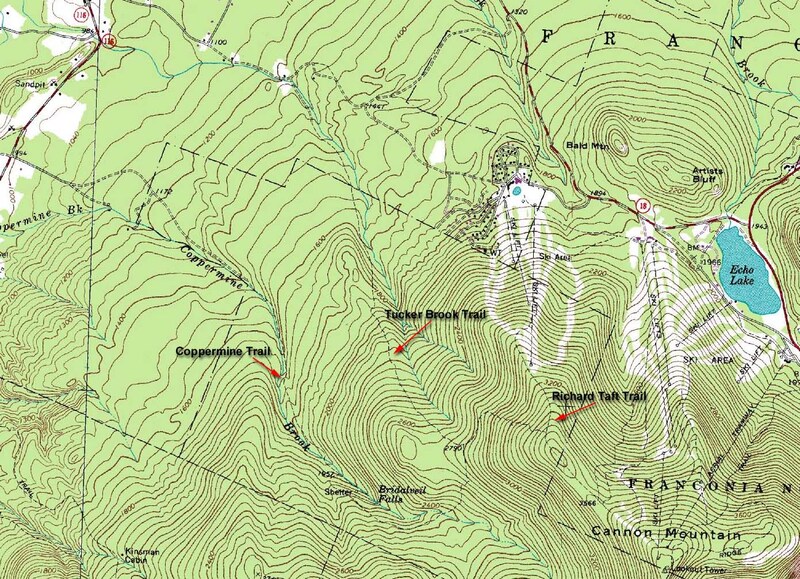 The latter may be followed down L to NH 116 or R to the Taft Ski Trail and the Cannon Mtn. ski slopes. "